Scandalous! I saw an elbow. I hate those kinds of people. I saw this at a Rod Stewart concert. Before you ask me what I was doing there, consider Rod Stewart’s aging fanbase and the horrible nature of such circumstances and sagging. LOL. I like that term. I think it’s too early in the morning for Johnny to see so much skin… that’s not Paul’s. Hehe, thanks! In the last panel Paul and Benedict were originally looking straight at the girls, but then I quickly drew those doofy expressions and I swapped them out. I think it’s funnier this way. It was way too much fun to draw, anyway. “Inappropriate” might be the best sound effect in history. 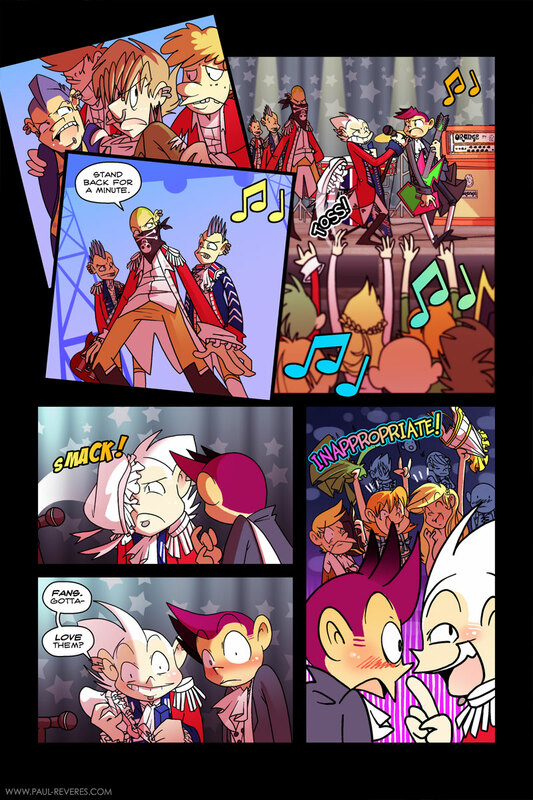 And OH GOD the vote incentive. It is made of creepy creepy joy. Haha! Now I want to make an animated gif of Paul waving his arms around like Kermit does. I figured I had to give Johnny something in the vote incentive since I made him suffer on the new comic page. Poor Paul though. He’s always suffering. LOL I love how awkward Johnny looks, thats what he gets though. You NEVER stand next to the groupies at shows. Also, if you disregard the scandal in the last panel, Benedict looks like he’s going to pick Paul’s nose. Why isn’t Johnny stripping too! Or for that matter Benedict or Paul! Haha. This is not that kind of comic! I feel bad enough putting those chicks in there! Johnny looks so disgusted! And that last panel TOTALLY looks like a Class-A Nose Pick! That’s so awesome. LOL! Those boys’ calves would be the equivalent of a pretzel rod. NO DEFINITION LIANNE! rofl. XD Pretzel rods are HOT. Nah, it’s blond girl’s bonnet. They happen to look the same… but different colors.